I really like the tourists in Greenwich. I like the way they wander about with a guidebook, I like the thought that a smelly red telephone box appears to be the greatest thing they have set their eyes on, I like their nice matching jackets (couples) and I like their sensible walking shoes. But best of all I like that they go through the ritual of looking at the menus in pubs. Why bother? We all know they are only going to order fish and chips anyway. The trouble is they’ve all pushed up the prices of a quick-and-easy pub lunch for the rest of us. Fish and chips? That’ll be a tenner, sir. Bangers and mash. Nearly the same. Solution? Head to the Taste of India, where the lunchtime buffet is just £5.95. Treat it like a tasting menu: Chicken Pakora, Chicken Tikka, Chicken Jalfrezi, Lamb Karahi, Niramish (mixed vegetables), Tarka Dall (lentils), naan bread, the list goes on and on because the buffet changes every day. There are also dishes that don’t appear on the regular menu. Which is how I finally found my green curry. If it’s not fresh vegetables then green is not a colour we normally associate with tasty food (think of our associations with algae etc) but the Taste of India’s Green Tandoori Chicken breaks the mould (prejudice). 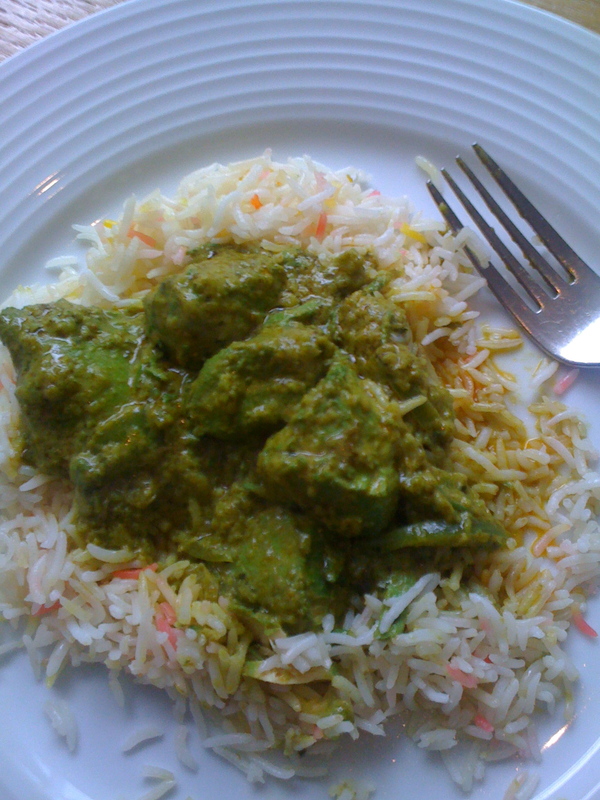 The lunchtime menu is made for working through, but I found it impossible not to return for more of this green dish and forgo even a bit of a taste of the other dishes. It’s cooked in the tandoor, as would tikka, but it’s been marinated in mint instead of the spices that gives it the red colour. Who needs overpriced fish and chips anyway? We’ve had many a good meal at the Taste of India. I totally agree with your ratings, except for service which I’ve found to be very friendly and efficient. I love the Taste of India but do think the service could be a bit more cheery. Once I’ve got chatting to them they are really nice; think they are a bit shy!